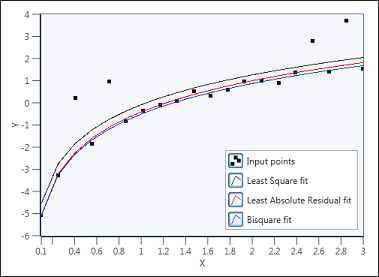 Returns the logarithmic fit of a data set using a specific fitting method. e 2.71828 Uses the natural logarithm. 10 10 Uses 10 as the base of the logarithm. 2 2 Uses 2 as the base of the logarithm. Array of dependent values. The length of y must be greater than or equal to the number of unknown parameters. Value that determines when to stop the iterative adjustment of the amplitude and scale. For the Least Square and Least Absolute Residual methods, if the relative difference between residue in two successive iterations is less than tolerance, this node returns the resulting residue. For the Bisquare method, if any relative difference between amplitude and scale in two successive iterations is less than tolerance, this node returns the resulting amplitude and scale. Upper and lower constraints for the amplitude and scale. If you know the exact value of certain parameters, you can set the lower and upper bounds of those parameters equal to the known values. Lower bound for the scale. Default: -Infinity, which means no lower bound is imposed on the scale. Upper bound for the scale. Default: Infinity, which means no upper bound is imposed on the scale. 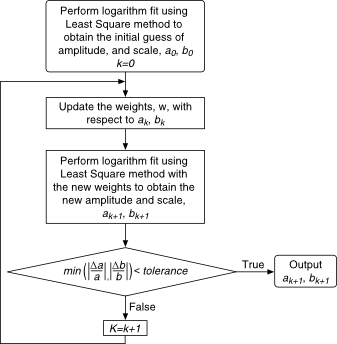 The bisquare method of fitting finds the amplitude and scale of the logarithmic model using an iterative process, as shown in the following illustration. Scale of the fitted model. This node finds the values of a and b that best fit the observations (x, y). The following illustration shows a logarithm fit result using this node.